With some sense of what could influence telecenters being used for their indented purposes – given its mix of generic ICT offerings – information, connectedness and devices, telecenters – in their many forms – can attempted to be understood by the ensuing framework. 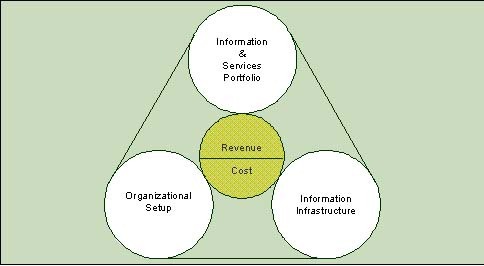 This framework has three base components: (1) Information & Services portfolio, (2) Organizational Setup and (3) Information Infrastructure, which with their varied degrees of influence characterize telecenters. Further – access, awareness and interface – (the critical elements in ‘making IT used’) in telecenters are also the derivatives of these above mentioned three components. In many cases, in order to be commercially viable, telecenters have drawn from the experiences of profit oriented entities, where keeping revenues up and costs low becomes a priority too. Telecenters with Cyber Cafes models are good example of this kind. Therefore this factor also gets positioned along sides the base parameters and helps in understanding the holistic picture. The information and services needs of the communities are often under-captured, (in many instances because of incapacity in articulation). Nonetheless, availability of relevant and adequate information and services, has understood to be of great significance in getting the telecenters visited and used by members of the communities. Furthermore partnership with appropriate service providers further enhances the scope of deliveries at telecenters and its influence. The ways in which telecenters are managed – either as stand-alone setups or part of a network – organizational arrangements, plays an important role in characterizing the telecenters. Management structures, including ownership arrangements at different levels (especially when, the telecenters are functioning in a ‘hub and spoke’ model – having many telecenters linked with a hub center for support services) influences its usage patterns. Responsibilities at these different levels also varies, from running of day-do-day operations in a single unit to the tasks which are strategic and are applicable organization wide – such as building partnerships with service providers, developing standard operating procedures etc. The available hard and soft infrastructure such as connectivity, electricity and community ownership in a specific location not only influences the decision of setting up of telecenters but also affects the range of information and services being delivered through these setups. Online and offline delivery modes of many information and services in telecentres are highly influenced by this parameter.